I have a Profile abstract entity and it has 2 children is DoctorProfile and UserProfile. 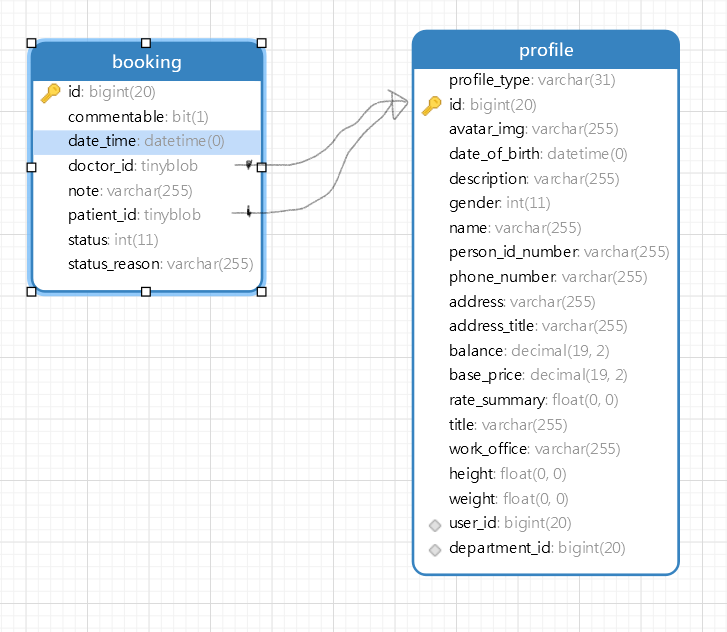 When an user book a doctor, it’ll be saved in Booking entity. What should I add to the entities to do that? I’ve tried in this link but it doesn’t work. 2019-04-06 23:35:23.613  INFO 15972 --- [           main] .s.d.r.c.RepositoryConfigurationDelegate : Bootstrapping Spring Data repositories in DEFAULT mode. 2019-04-06 23:35:23.693  INFO 15972 --- [           main] .s.d.r.c.RepositoryConfigurationDelegate : Finished Spring Data repository scanning in 63ms. Found 0 repository interfaces. 2019-04-06 23:35:25.863  INFO 15972 --- [           main] com.zaxxer.hikari.HikariDataSource       : HikariPool-1 - Start completed.